All of our guest cabins have electric heat, in room coffee, a bar size fridge and 3 or 4 piece bathroom. 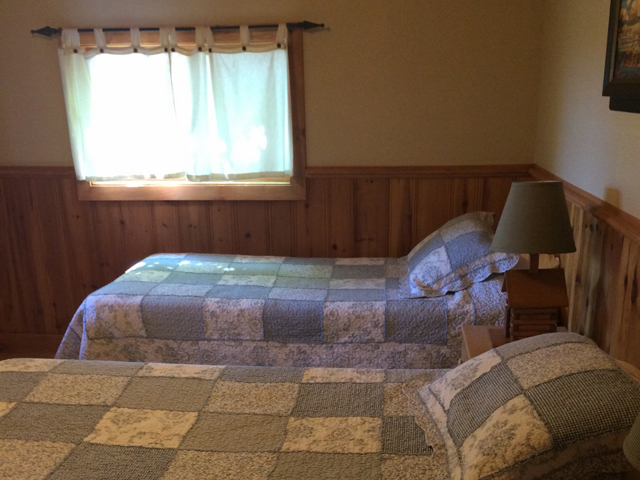 All king size beds can be split into 2 single beds and all cabins have screened in porches. 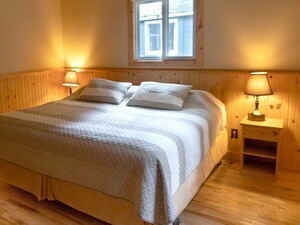 Newly renovated in the spring of 2010, this lovely 2 bedroom cabin has a king size bed and 2 singles. The sofa bed in the sitting will pull out to make accommodation for up to 5 people in the cabin. It also has a modern 4 piece bathroom. 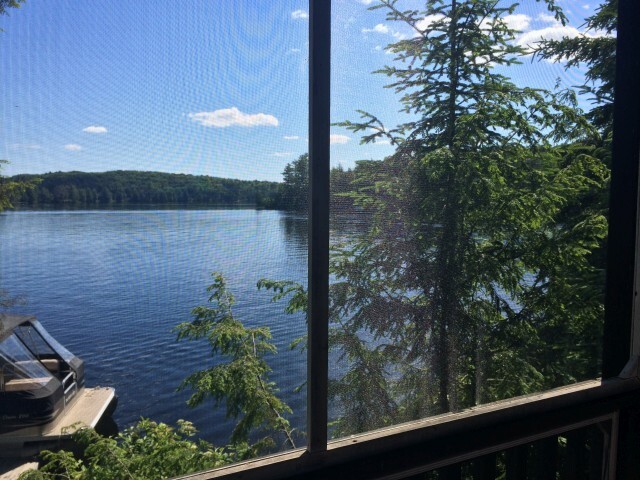 Guests have a wonderful view of Cache Lake from the large window of the sitting room or the newly refinished screened porch. 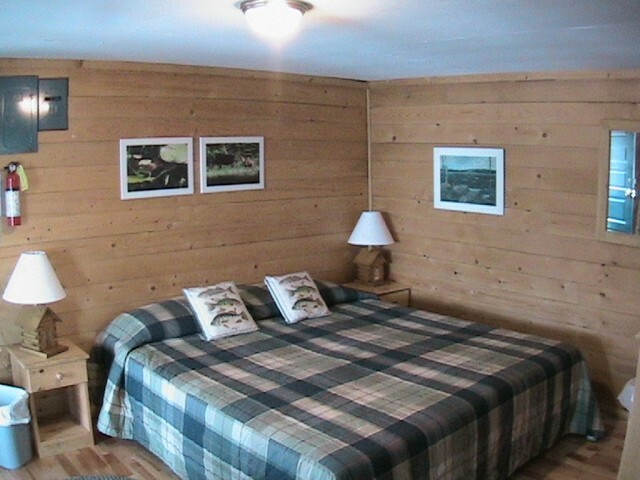 All of our guest cabins have electric heat, in room coffee, a bar size fridge and 3 or 4 piece bathroom. 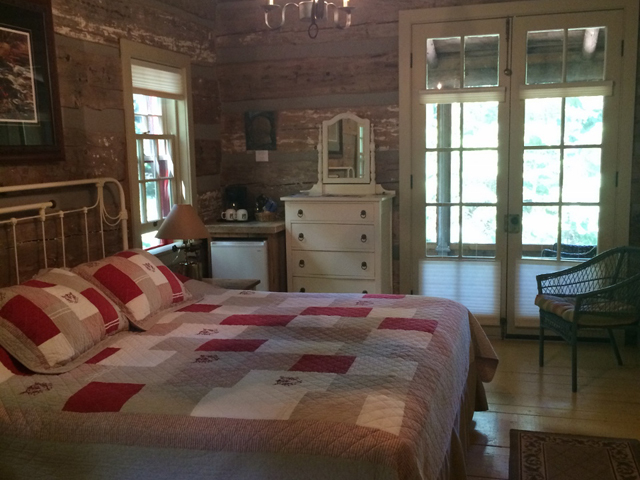 All king size beds can be split into 2 single beds and all cabins have screened in porches. 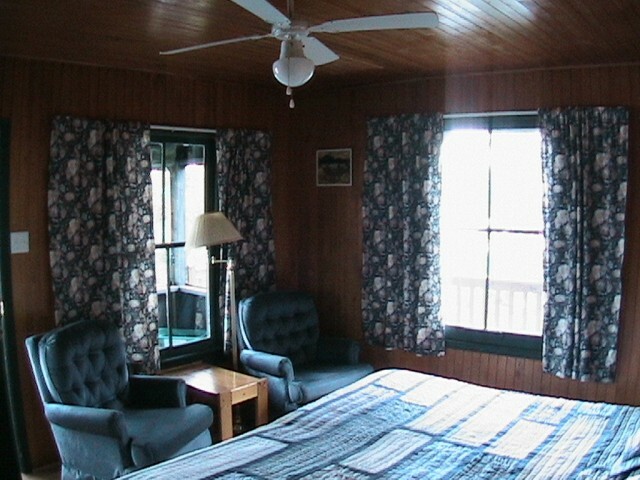 A unique one bedroom with an adjoining living room are the main features of this comfortable cabin. The glow of the fireplace adds to its particular charm. 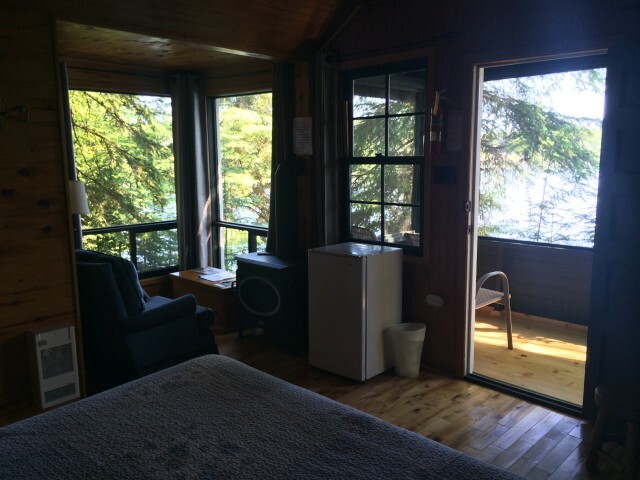 All of our guest cabins have electric heat, in room coffee, a bar size fridge and 3 or 4 piece bathroom. 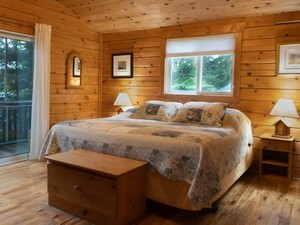 All king size beds can be split into 2 single beds and all cabins have screened in porches. 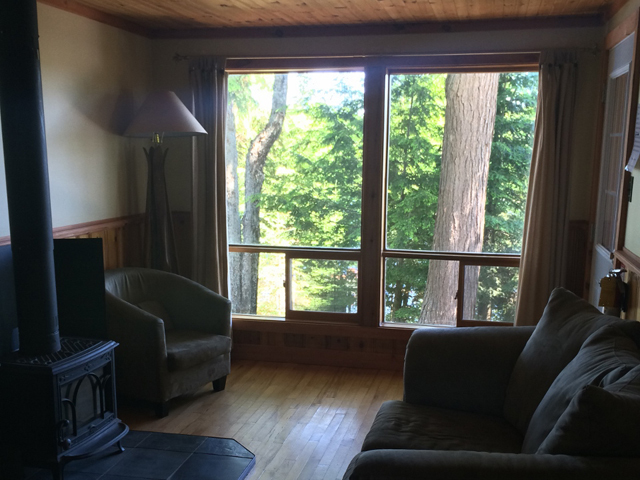 At the highest point on the property a large living room with huge picture windows and a propane stove make this cozy cabin one of our most popular. There are two bedrooms one with a king size bed and one with two singles. 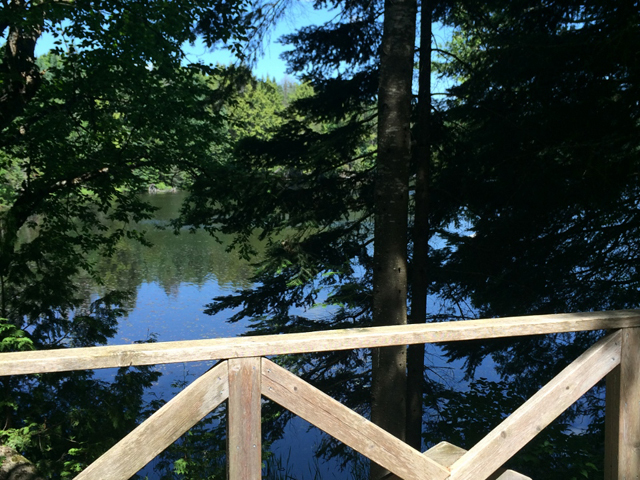 For unsurpassed views of the park, try Northern River. Please note there are minimum occupancy requirements for this cabin during Peak seasons. All of our guest cabins have electric heat, in room coffee, a bar size fridge and 3 or 4 piece bathroom. 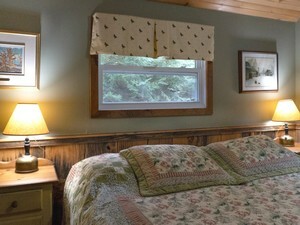 All king size beds can be split into 2 single beds and all cabins have screened in porches. 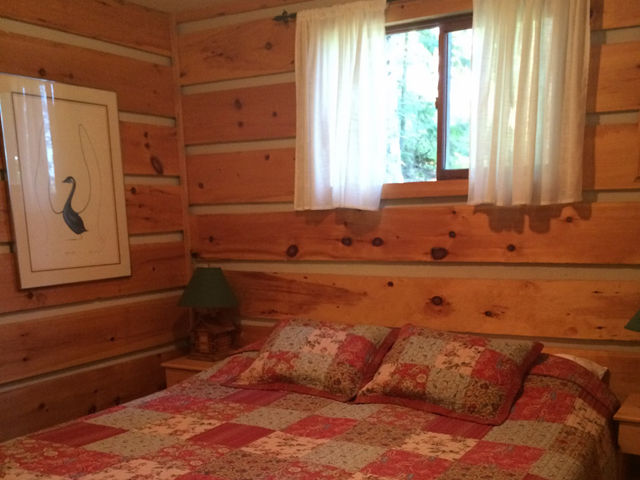 Perched on the shore of Cache Lake, this cabin was completely renovated in 1999. 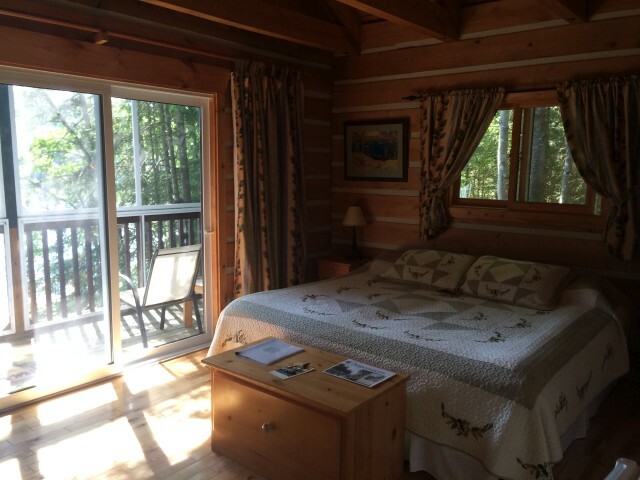 A large screened porch across the entire front of the cabin, a king size bed and 3 piece bathroom, makes this cozy one bedroom a guest favourite. All of our guest cabins have electric heat, in room coffee, a bar size fridge and 3 or 4 piece bathroom. 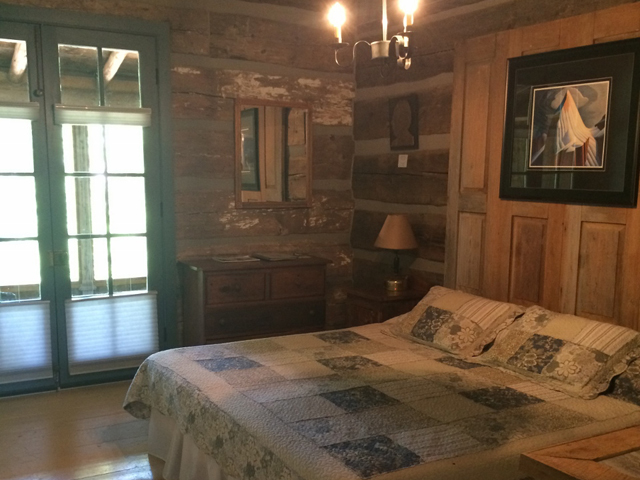 All king size beds can be split into 2 single beds and all cabins have screened in porches. 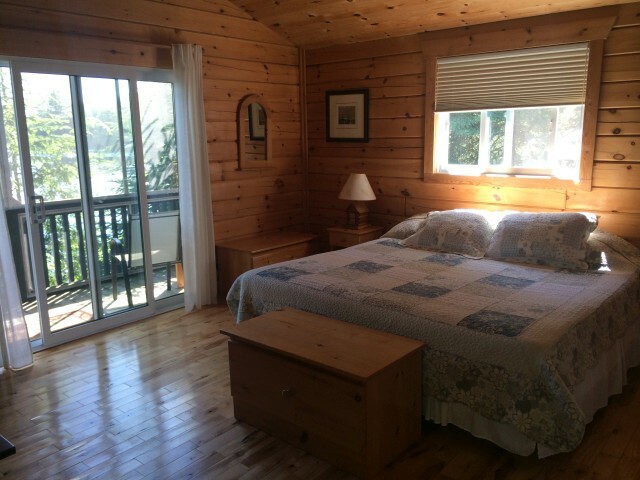 This shoreside one bedroom cabin has a large screened in porch, king size bed and new bathroom. 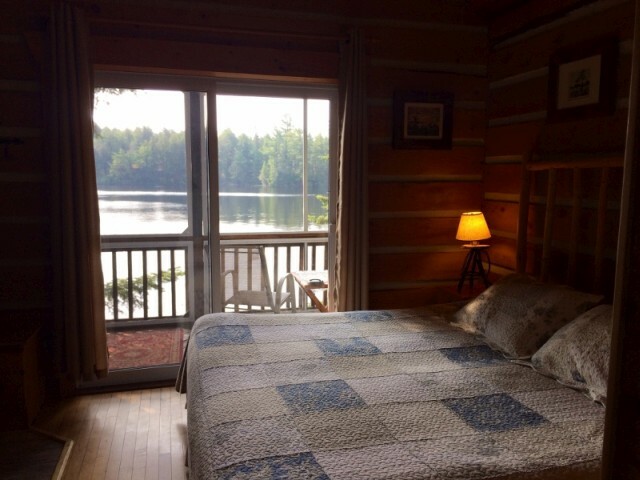 Go to sleep with the sound of the waves rippling against the shore or listen to the loons and the evening sounds of Algonquin. All of our guest cabins have electric heat, in room coffee, a bar size fridge and 3 or 4 piece bathroom. All king size beds can be split into 2 single beds and all cabins have screened in porches. Brand new in 2004 - this log cabin is an environmental masterpiece. It is powered by the sun and energy self sufficient. Sunrise is on the shore of Cache Lake. 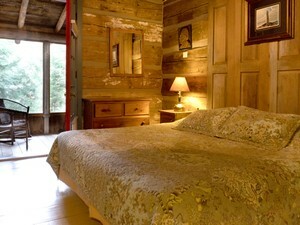 It has a large bed sitting room with a king size bed, sitting area and wood stove. The second bedroom has a bunk bed with a double bed as the bottom bunk. There is also a fourth piece bathroom. The screened porch completes this unique guest cabin. PLEASE NOTE: Sunrise is our solar powered cabin. 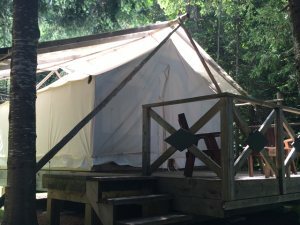 It is completely off the grid and is not connected to Ontario Hydro. Sunrise operates on a 12V electrical system and as a result there are a few things that will operate differently. Please note that standard appliances such as hair dryers, phone charges and electric razors etc. cannot be used in this cabin. We will provide a 12V hair dryer and other appliances in the cabin that will operate on a 12V power system. We are able to provide you with alternative options such as the office or lounges for charging your phones or other electronics. Heat for the cabin comes from a small high efficiency woodstove. 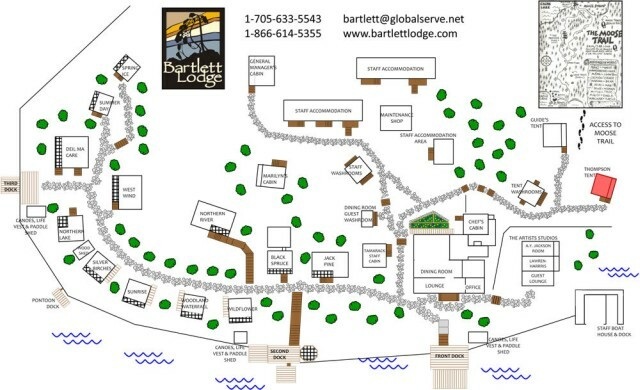 All of our guest cabins have electric heat, in room coffee, a bar size fridge and 3 or 4 piece bathroom. 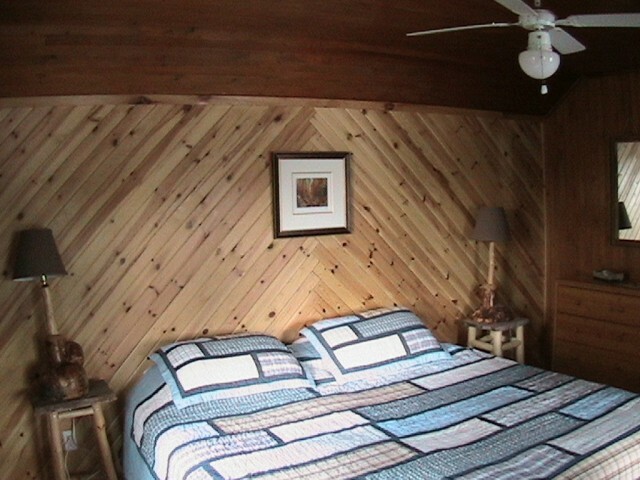 All king size beds can be split into 2 single beds and all cabins have screened in porches. 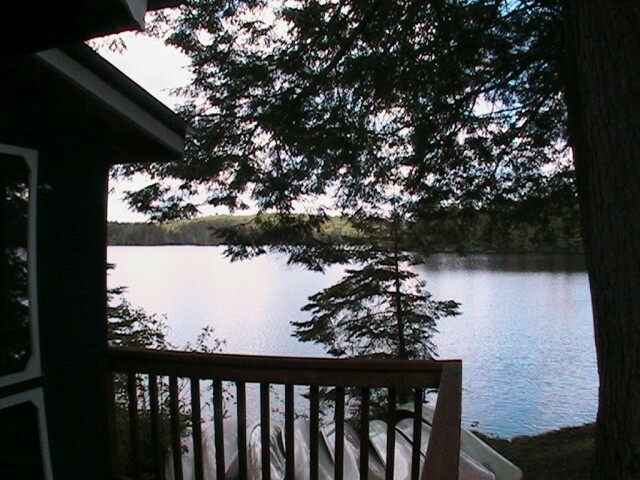 A shoreside log cabin built in 2001 with a screened porch overlooking Cache Lake. 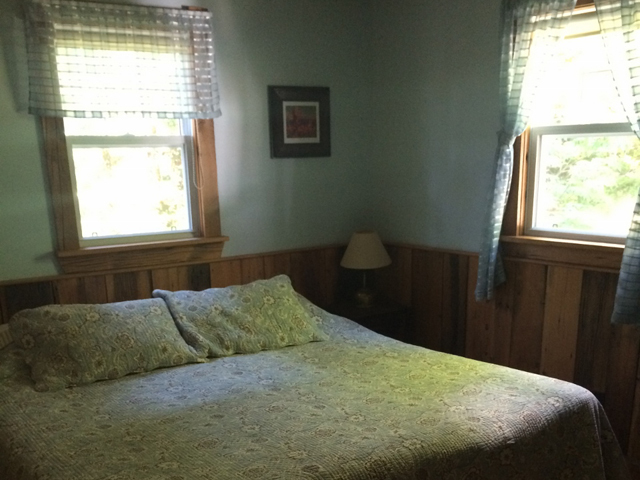 Silver Birches has a large bed sitting room with a king size bed. The second bedroom accommodates a set of bunk beds for the kids. The four piece bathroom makes Silver Birches the finest in Algonquin Park accommodation. 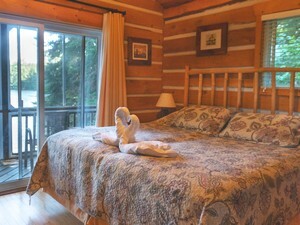 All of our guest cabins have electric heat, in room coffee, a bar size fridge and 3 or 4 piece bathroom. 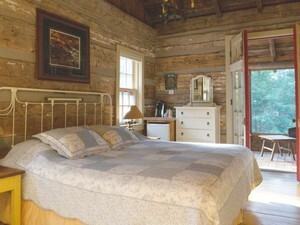 All king size beds can be split into 2 single beds and all cabins have screened in porches. 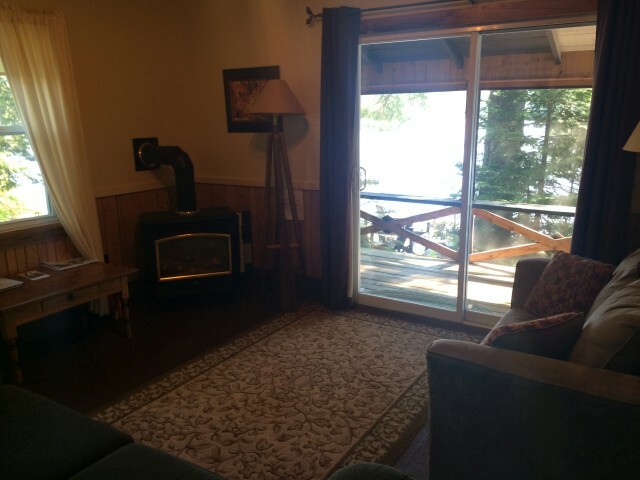 Right on the shoreline, this newly renovated 2 bedroom cabin has a cozy sitting are with a glass front propane stove. 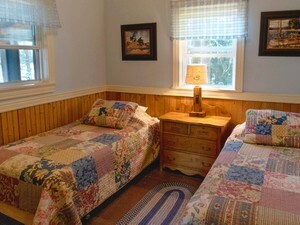 The main bedroom has a king size bed with access to the bathroon, the second bedroom has two single beds. 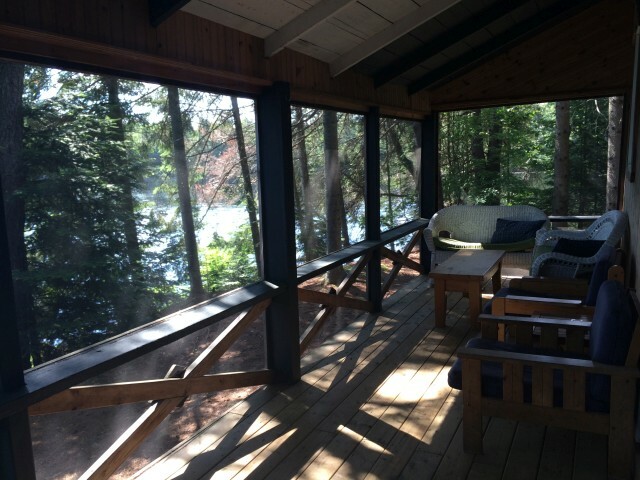 Guests enjoy the panoramic view of Cache Lake from the logged frame screened in porch with patio door access from the sitting area. All of our guest cabins have electric heat, in room coffee, a bar size fridge and 3 or 4 piece bathroom. All king size beds can be split into 2 single beds and all cabins have screened in porches. 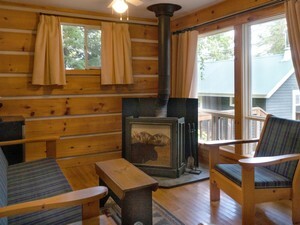 Three bedrooms, a screened porch and a living room with a wood stove make Westwind one of our most popular cabins. 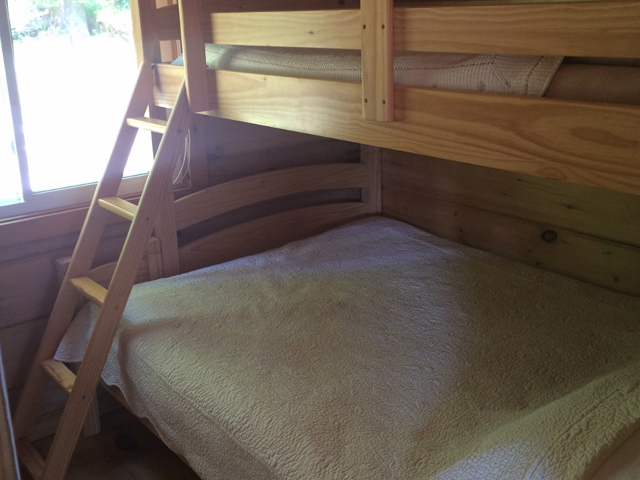 Two of the bedrooms have king size beds and the third has bunk beds for the kids. 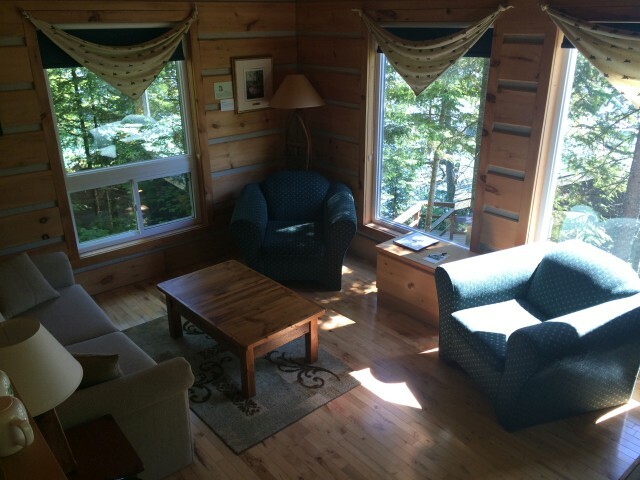 Sit in the screened porch in the evening as you take in the sounds of the Algonquin wilderness. Please note there are minimum occupancy requirements for this cabin during Peak seasons. 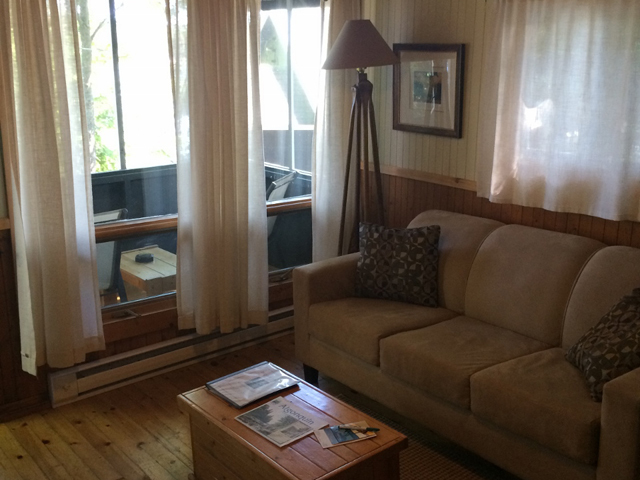 All of our guest cabins have electric heat, in room coffee, a bar size fridge and 3 or 4 piece bathroom. All king size beds can be split into 2 single beds and all cabins have screened in porches. 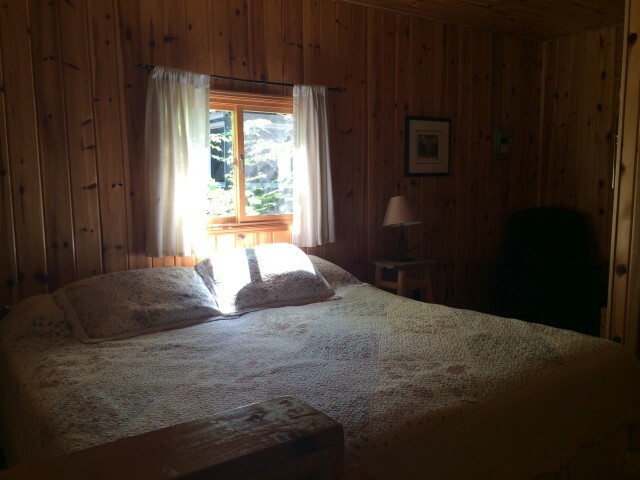 One of the original buildings in the Park -built in 1898 and lovingly restored in 2001 - Deil ma Care is the finest guest cabin in Algonquin Park. 3 bedrooms, 2 with king size beds and a third with 2 singles. 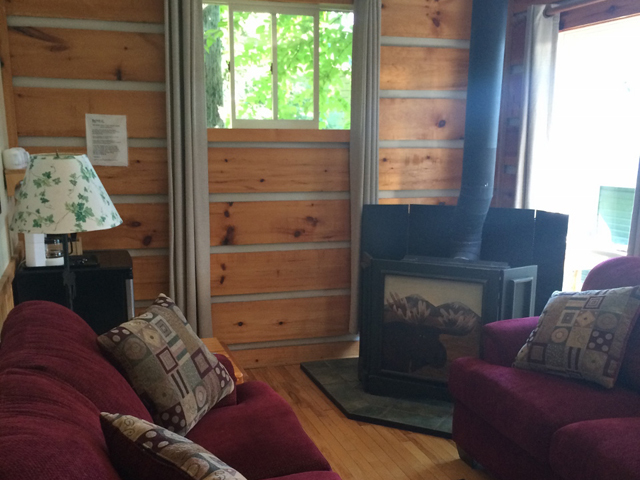 A living room with a propane stove and large screened in porch at the shorline of Cache Lake. 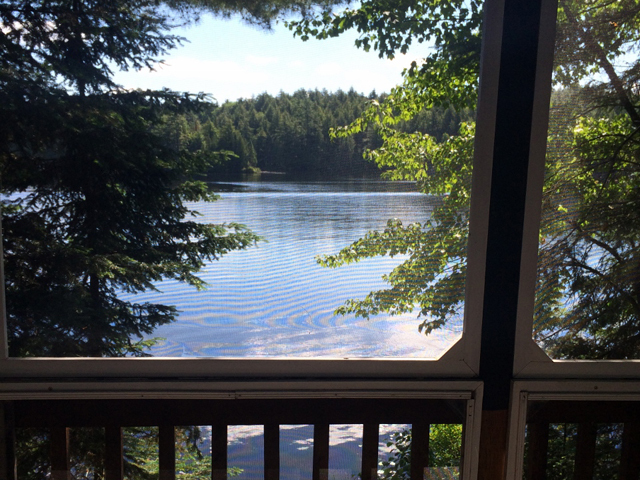 This beautiful cabin is a piece of Algonquin history. Please note there are minimum occupancy requirements during Peak Season. 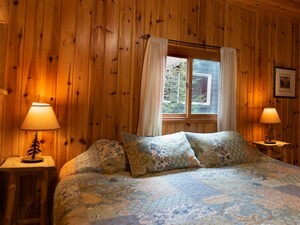 All of our guest cabins have electric heat, in room coffee, a bar size fridge and 3 or 4 piece bathroom. 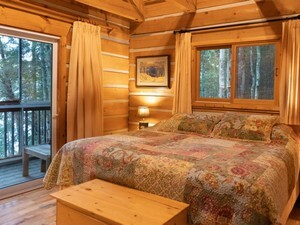 All king size beds can be split into 2 single beds and all cabins have screened in porches. 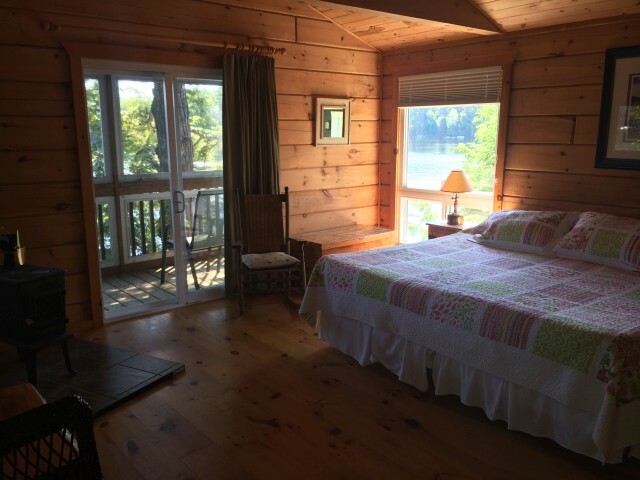 A one bedroom log cabin built in 1997 at the quiet end of our shoreline, Summer Day has all the character of a log cabin, king size bed and a four piece bathroom, inside sitting area and large screened porch. 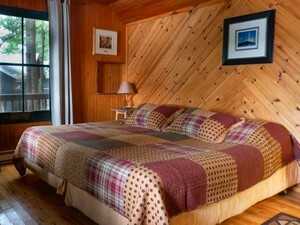 All of our guest cabins have electric heat, in room coffee, a bar size fridge and 3 or 4 piece bathroom. All king size beds can be split into 2 single beds and all cabins have screened in porches. Built from squared Hemlock logs in 1999, this one bedroom cabin has a four piece bath and king size bed. It also has a small bedroom with a set of bunk beds. Spring Ice is located on the quietest part of the Lodge property. 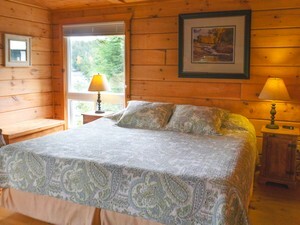 All of our guest cabins have electric heat, in room coffee, a bar size fridge and 3 or 4 piece bathroom. All king size beds can be split into 2 single beds and all cabins have screened in porches. Each tent is built on a wooden platform with wood sided walls. The interior is fully protected from the outside elements. 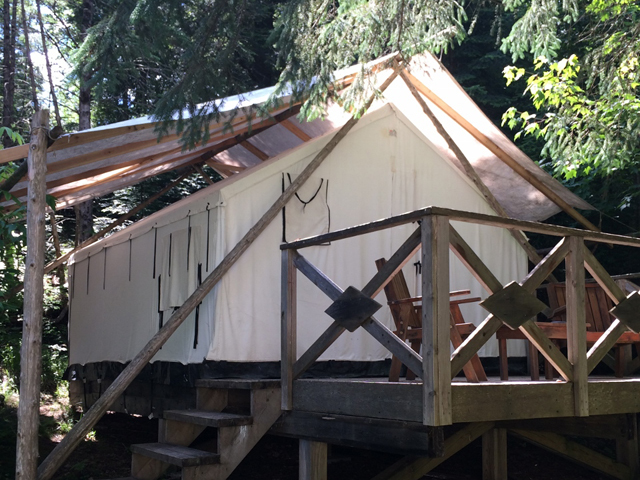 King-size beds, throw rugs and a seating area in the tent are all part of our new accommodation. A new bathroom with shower is located close by. Stay in modern comfort in a traditional Algonquin Park platform tent. 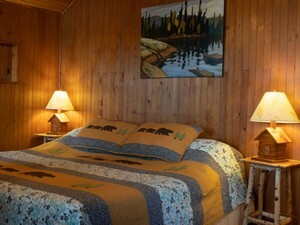 All of our guest cabins have electric heat, in room coffee, a bar size fridge and 3 or 4 piece bathroom. 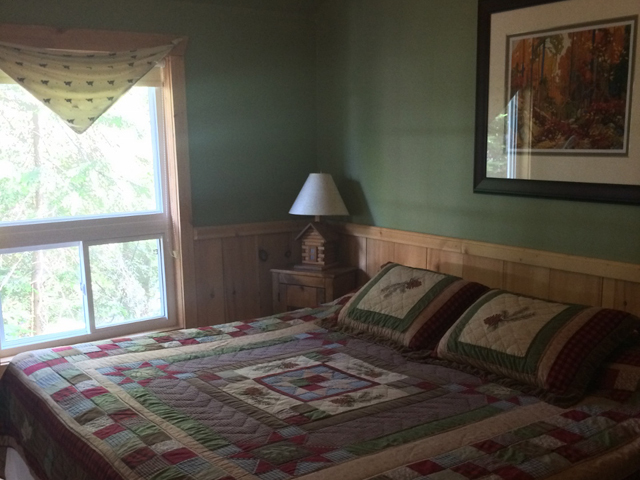 All king size beds can be split into 2 single beds and all cabins have screened in porches. Constructed in 2011, these 2 suites are part of a l30 year old log building constructed at Bartlett Lodge. This building also includes a new Guest Lounge. There are two Artist Suites. Each includes a three piece bathroom, one king size bed that can be split into 2 single beds and a private screened porch facing a small bay on Cache Lake. Tastefully furnished with antiques and featuring art by the Artist for whom the suites were named. This unique accommodation is not to be missed. 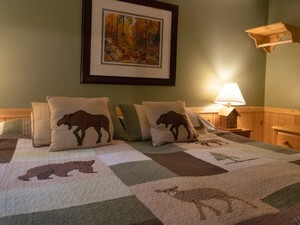 The suites are named after the founding members of the Group of Seven, Lawren Harris and A.Y. Jackson.